Greetings to all precious people of god in the matchless name of our lord Jesus Christ. After all attempts to save a patient fail, a well experienced practicing doctor will say to pray. After all attempts to save a plane from crash fail, a qualified pilot will say to pray. The world will say ‘to pray’ only at the end, when all other efforts fail. But it was only Jesus who said and taught us to pray ‘first.’ Practically speaking, most of the folks pray when they are in trouble or when they smell trouble, but this is wrong! Christ did not teach us this way. Prayer is not a onetime process. It must continue till we are with Christ. I Thessalonians 5:17 says “keep on praying” There is a saying “The more men pray, the less worldly they become, and the less men pray, the more worldly they become- David Ravenhill.” The most arrogant person in the world is the one who do not pray. Yes! You heard me right. You do not pray because of pride. Praying is talking to god and seeking his help. Praying is relationship with God and praising god. Praying is worshiping god and knowing the will of god. Praying is asking god, and the person who do not do these things thinks that he can stand by himself. Prayer is like the fuel in a car without which, the car cannot move even an inch. If your life is stuck in between, check if there is fuel (prayer) in your system. Some people pray only when they are in trouble. God being merciful delivers them from all their troubles but after the turmoil is over, they are back to normal (i.e. prayer less life). Now they will remember to pray only when they get into a new trouble. Prayer is very important. Let us sleep less and pray more. Now today I want to share about the power of persistent prayer. Christ, while teaching his disciples about prayer, he mainly gleans the importance of persistent prayer. He showed the manner of prayer and its importance. Our joy, prayers, and thankfulness to God should not fluctuate with our circumstances, needs, or feelings. Obeying these three commands — rejoice, persevere, and give thanks — often goes against our nature. But if we practice consciously the decision to be obedient, we will gain a new outlook. The word persistent means “Remaining in the same state for an indefinitely long time or refusing to give up”. Lord wants us to remain in prayer; God wants you to be soaked in prayer, in his presence. I love the word ‘soaked.’ Before putting the clothes into the washing machine, my mom soaks the clothes in the solution of washing powder. I asked her why she wasted the time in doing this. She said that when you soak the clothes, it is easier to wash them; the dirt is removed by concentration of the chemical in the powder. Oh my God! If a local washing powder can remove the stains of dirt on the clothes, when submerged in its solution, then how much more will the stains on us be removed when we sit and remain in the presence of God for an indefinitely long time? When was the last time when you were soaked in the presence of god with prayer? Another meaning of the word ‘Soak’ is ‘to absorb.’ When I remain in prayer, I not only absorb the peace of god, but I also give up my fear of uncertainty. Really, if you understand the power of the persistent prayer, your life and perception will change. 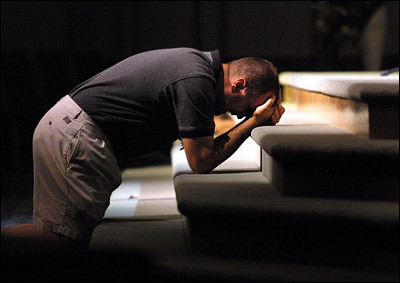 I remember the times when I kneel down for prayer. There are times when I never hear the voice of god or see his guidance. Sometimes I do not get words and sometimes I think that I have lost my faith. But through all those thin ways, God was teaching me to remain in prayer. Do you give up when you don’t get words to pray? Do you lose heart when you see your prayers are unanswered? If yes!! Change your mindset today. We quit because we have set our own times , forgetting the fact that god does not move with our time. But he does things in his time. This is very simple but most of us do not know this basic. In other words, before you kneel down for prayer, you must be willing for the will of god. Impatience is short-term. God answers prayer in His timing, in His way, for His purpose. Although we may not understand, perseverance may bring unexpected blessings. Let us wait on the lord. Let us see in points the outcome of waiting or persistence. •	They shall Walk- and not faint. One brother was tired of praying and asked me “How long should I wait”. I replied “Wait till the will of god happens”. Jesus waited for thirty three and half years for the will of the father to happen. He did not force anyone to crucify him to do the will of the father. He waited till the time appointed by the Father and I heard him saying in John 17: 4, “I have glorified you on the earth. I have finished the work which you have given me to do.” (Read the prayer of Jesus in John 17). He set a good example for us. Let us follow him and let us remain and soaked in his presence with prayers. Let us see what Jesus taught us about persistence. In Luke 18:1-8, we can see one helpless widow and a cruel judge who did not fear God and regard man. She approached this unjust judge by having a good knowledge about his character, that he regarded no man. But she did not give up and took her petition to him. This man refused it and did not act on her petition for a while. If we were in her place, we would have quit going to him next time because we know his character. But this widow troubled him with continual visits. I believe she used to visit him daily and weary him daily until she got justice from her adversary. She was a determined woman. Even though he had heard this widow’s petition and saw she had a case, he would not do as she asked. He simply turned a deaf ear to her pleas for help. He was hard hearted and close minded to the needs of others. C. V. 4b-5 He Was Condescending – In spite of his spiritual condition and in spite of the fact that he did not care for this widow in the least, in the end, he helped her! Why? The answer lies in verse 5. There are two words there that are of special interest. 2.) Weary – This word means “to beat down, to blacken the eye”. It is a word used to describe the effects of being beaten severely about the head. Evidently this means that her continually coming before him and her constant crying was hurting this man’s reputation. She was giving him a “black eye” in the community! She knew that the wicked judge can only give her the answer. At last! This judge said to himself “Yet because this widow troubles me, I will avenge her”. If this wicked Judge avenged her request, how much more will our Heavenly father who is a merciful god,he hear our prayers, he honors our persistence, he handles our petition. I have underlined the word ‘trouble’ because the petition of the widow troubled the Judge. But our petition does not trouble God. Your constant prayer does not weary god. Persistence in prayer does not mean you are troubling god. In fact we learn patience which leads to a perfect work. If your need is more, your persistence in prayer will be more and vice versa. She was persistent for herself and her request. But Jesus taught us that we should not only be persistent for ourselves. Rather we must be persistent in prayer for others also. Is it possible for you to be persistent in prayer for others? We are so selfish sometimes that we go to any extent to receive our blessings, our family needs, and our requirements. Prayer must not be self centered. We must be persistent in prayer for others also. Let us see through the scriptures. In Luke 11:5-10, we see a man who went up to one of his friends seeking help for another friend who had come to his house. This man was not seeking help for himself but he was seeking help for his friend. In the later text, we see that though his friend refused to open the door, he did not go from there. He kept knocking and remained where he was. At last, because of the persistence, his friend rose up and gave him all his needs. Why was he persistent even though his friend had refused him to open the door? What made him to remain persistent? If you notice, his friend did not refuse him the bread. He only refused to open the door. He knew that his friend had the bread inside the house and a little persistence would make him to get up from his bed and give him what he needed. The answer is already inside, but if you remain constant, you will receive it. This man was interceding or was persistent for his friend. How much persistent are we for other people? Do you hold patience while you pray for your friends? ‘Jacob was left alone and a man wrestled with him until the breaking of day. Now when he saw that he did not prevail against him, he touched the socket of his hip…God touched the strongest part of Jacob in other words he (Jacob) was weak but he did not give up he did not let the angel of god go and said “I will not let you go unless you bless me”’. And we know the result that Jacob was blessed there. He wrestled for his blessing the whole night and did not give up. His persistent prayer changed his name & character and lead to a nation called Israel. Persistence is not repeating words. Some people think that when they repeat words for sometime, god will hear them. Persistence is determination of your heart.Be committed to prayer. Be consistent and persistent in prayer. Do not give up !! Keep on praying ! The answer is on the way !